This year’s Earth Day celebrates our approximately 8.7 million diverse species. Zooming in to the High Line, over 110,000 plants, nearly 530 species, now grow on the park. The gardens also support a variety of resident and migratory birds—catbirds, mockingbirds, kinglets, tanagers, orioles, grosbeaks, woodpeckers, flickers, hawks, doves, sparrows, robins, ravens, cardinals, finches, and warblers—as well as bees, moths, flies, butterflies, dragonflies, crickets, and spiders. In honor of Earth’s dedicated day, we’re sharing a few of the ways we support our species and our planet by caring for our own local ecosystem. Let these spark inspiration for ways to practice sustainability in your home garden, rooftop container, or window box. 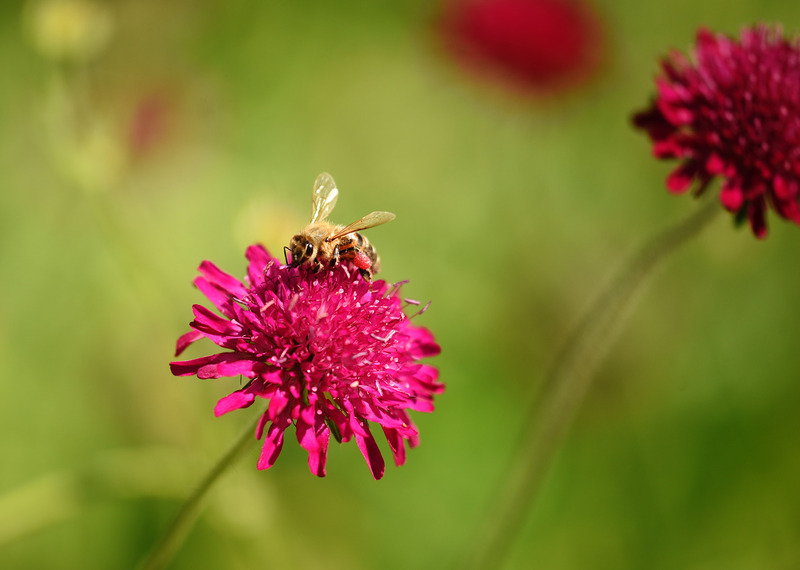 As we learn more about how our horticultural practices affect the many lifeforms that make the park their home, we’re taking new steps to better protect the habitats of bees and other important pollinators. In 2017, we collaborated with entomologists from the American Museum of Natural History to learn more about the different kinds of wild bees that nest and feed in the park. The scientists collected samples throughout the summer and catalogued over 30 species of wild bees, including small carpenter bees and seven of the 15 Hylaeus (masked bee) species that live in New York State. These solitary bees build nests by sealing pollen along with their eggs into plant stems—including stems no wider than a plastic coffee stirrer! As an experiment during Spring Cutback, we left four different plant species with slender stems in place to see if this would increase spring emergence of wild bees in the park. We’re also leaving more leaf litter in the gardens as habitat for beneficial invertebrates, like spiders and earthworms. 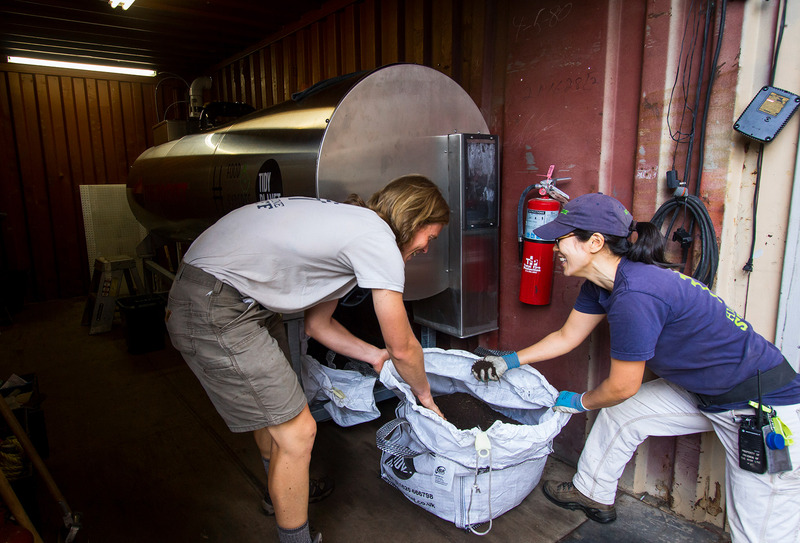 We regularly amend our soil with compost made from plant material collected from the High Line gardens. Adding compost to our soil improves its overall health by increasing its ability to hold moisture, and adds necessary structure to allow air and water to get to plant roots. Compost is created from a mix of nitrogen and carbon sources—generally nitrogen sources are considered “greens” (i.e. food scraps, grass clippings), and carbon sources are considered “browns” (i.e. dried leaves, straw, woody material). Combining the two in a roughly one-to-one ratio, with enough moisture the concentrated pile will recycle organic material more quickly than if those materials were left on their own. On the High Line we collect coffee grounds from local businesses as a green and efficient way to break down materials. In a typical compost pile, finished compost is ready to be added to soil after two to three months. A compost pile is easy to start in your backyard or community garden: check out NYC Compost Project for more information about where and how to compost in NYC. 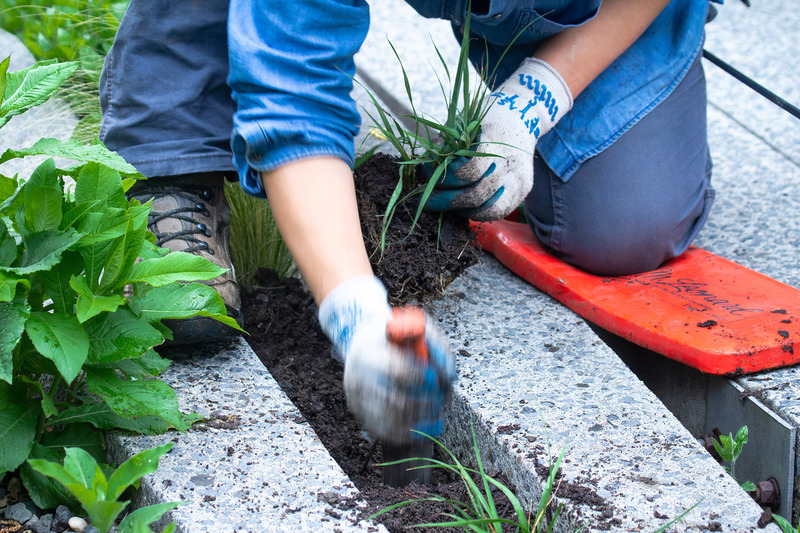 While many people think of soil as inert, it’s actually a lush ecosystem that teems with bacteria, fungi, protozoa, and insects. Supporting this underground ecosystem is one of the best ways to keep our plants healthy. Before chemical fertilizer was developed, only bacteria could convert atmospheric nitrogen into food plants can use. When other critters in the food web feed on bacteria, they release the nitrogen and other essential nutrients stored in the bacteria’s bodies back into the soil, where it becomes available to plants. We use an irrigation system divided into three garden zones that is automated for efficiency—watering happens early in the morning when the park is closed to visitors and when temperatures are at their lowest, which minimizes evaporation. 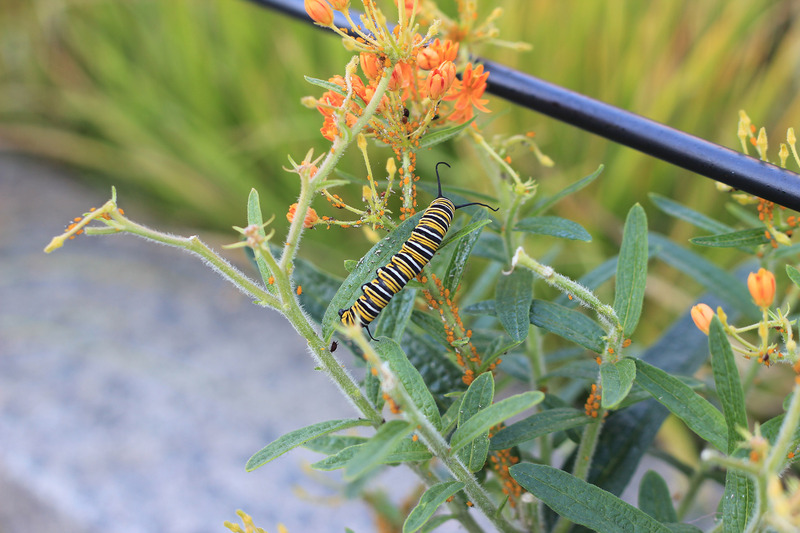 In the gardens, we use Integrated Pest Management (IPM) to determine when and how to control insect pests—all our inhabitants enjoy an environment free from herbicides and insecticides. First we reduce plant stress by choosing locations with appropriate light and moisture conditions for each plant species. A stressed plant not only has weakened chemical defenses but can actually act as a beacon that attracts pests. Then we determine thresholds for both aesthetics and plant health. As a naturalistic garden we have a higher tolerance for aesthetic damage than a more formal garden might, but there is still a point when we need to intervene. Intervention may take several forms, including biological controls and hand removal of pests and infested plant material. Maintaining a balance is at the heart of IPM. In order to attract beneficial insects and other animals, we need to allow pests to play a part in our gardens. Given the numerous challenges posed by habitat fragmentation, invasive species, and microclimates, IPM in our urban context demands both curiosity and agility. Lastly, the High Line is essentially a 1.45 mile green roof landscape built on the pre-existing concrete deck of a former freight line. Our gardens include a typical green roof drainage board, which is a plastic egg-crate-like layer underneath the soil that retains rainwater for plant roots to access as needed. Like most intensive green roofs in New York City, the High Line acts as a sponge for stormwater, absorbing an average of 80% of yearly rainfall. This is a critical service in New York City, where combined sewer and stormwater systems overflow untreated sewage into local waterways during most rainfalls. By absorbing rainwater where it falls, we limit how much stormwater is entering our already overburdened combined sewer systems. Happy Earth Day and see you outside! Learn more about sustainable practices on the High Line here.